Wind and currents carry unusual things onto the beach throughout the year. Some are just unique oddities, others require response from the Aquarium. Staff spend many hours every year on the beach or outdoors in the region noting local phenomena. Responses vary considerably depending on need. If it�s a huge herring influx at the cove that brings in bait-seeking dolphins, it may only require passing the information to local news agencies so the public has an opportunity to share the experience. If it�s a dead marine mammal, it can require our staff, leaders of the local Marine Mammal Stranding Network, to assist in dissections to determine the cause of death. 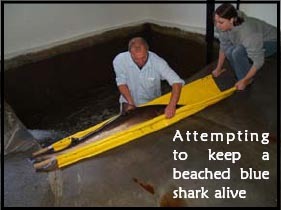 Live marine mammals are left on the beach with signs warning the public to remain at a safe distance. Exhausted birds pummeled by the surf are brought in by the public to rest at the aquarium and are released back into the estuary or are transferred to the Wildlife Rehab Center. If it�s a sea turtle or live animal, staff coordinate with larger aquariums to stabilize and transport the animal to someplace it might be rehabilitated. After large winter storms, they comb the beaches for kelp to feed the animals and possible skate egg casings. Some of the animals that wash ashore are not particularly unique in the ocean, but are unique to see appear on local beaches. (continued page 2) . The Seaside Aquarium held an open house December 9 to encourage the community to visit the aquarium and donate to some local good causes. 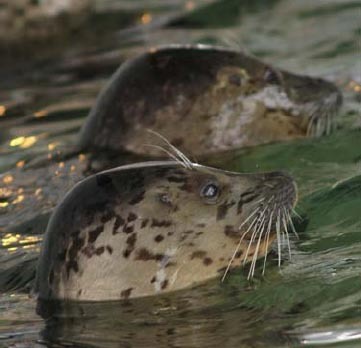 Admission was free all day and for every can of food donated, visitors received a container of fish to feed the seals. Over 600 cans, totaling 400 pounds of food, were collected for the local food bank. Six hundred nine visitors attended the festivities. In the interpretive center, visitors were greeted by aquarium staff and volunteers from the Haystack Rock Awareness Program, a nonprofit organization that interprets at the base of Haystack Rock every spring and summer. The ten volunteers shared information on local intertidal marine life. 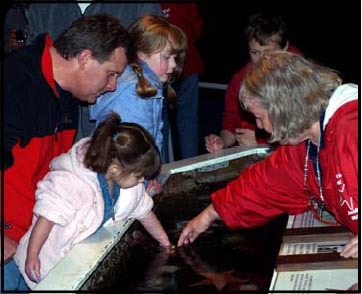 Visitors also had the opportunity to view recently hatched octopus babies (see article page 3) . The timing on this unique opportunity was perfect. We�ve had some hatch out this week, but a bunch more hatched yesterday. This is the largest number in the tank I�ve seen so far, commented Tiffany Boothe, the aquarium�s publicist.